After painting most of our 1970's fixer upper by myself, I've learned a few things about paint these past few years. 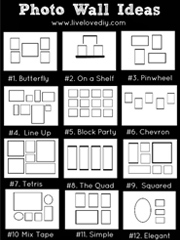 So, I thought it might be useful to share some of my favorite painting tips with you. These are my top 10 paint secrets that will save you time, money, and just make any paint job a whole lot easier. Enjoy! #1. For easy cleanup use tinfoil on your paint tray. I went through about 20 paint trays before I ever figured this trick out. 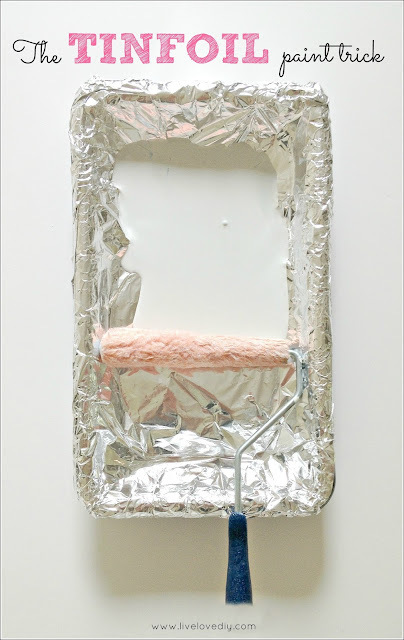 The next time you need you paint something, cover your paint tray with a layer of tinfoil before you pour the paint in the tray. When you're done, just remove the foil and throw it away. Your paint tray won't have a drop of paint on it and will still be good as new. You'll never have to wash another paint tray. High five on that one. #2. Use a paint pour lid on paint cans. Pouring your paint straight from the gallon into a paint tray can be really messy. So, before you ruin your fancy socks, go get a paint pour lid. They're about $2 here (affiliate link), and will make your life so much easier. Not only does it make the painting process quicker and cleaner, but since the lid is airtight, it makes your paint last so much longer. #3. Use vinegar and hot water to clean your paintbrushes. I wasted a lot of money having to buy new paintbrushes before I figured this out. I fill a small bowl with 1/2 vinegar, 1/2 hot tap water and soak my paintbrushes after each use for about 30 minutes. If your brush is in really bad shape, bring some vinegar to a boil and soak your brush in that for a few minutes. Wash it with some soap and water afterwards, and your brush will look like new. In the below picture, the left brush was just soaked in water, and the right brush was soaked in vinegar and hot water. To see the rest of my vinegar cleaning secrets, go here. #4. Use mineral spirits to clean oil based paint off brushes. The vinegar trick won't work too well if you're using oil based paints or topcoats. Instead, try using mineral spirits to clean your brushes. I threw away so many brushes after using them to put topcoats on furniture. 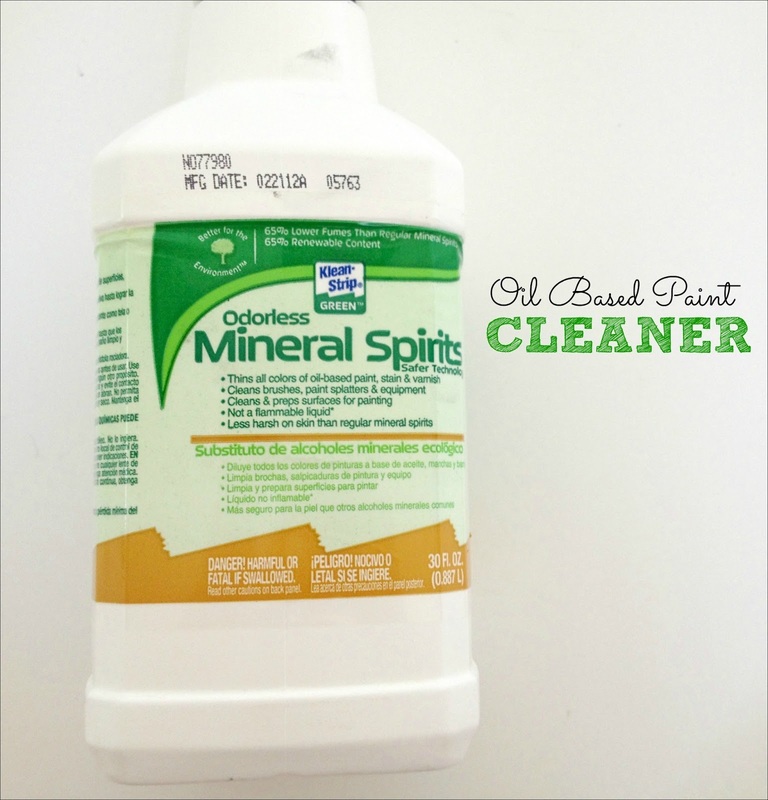 Now that I know about mineral spirits, I can reuse the same nice brush over and over. My favorite is Klean Strip (affiliate link) because it's super effective, but has a way less toxic odor than other brands I've tried. #5. 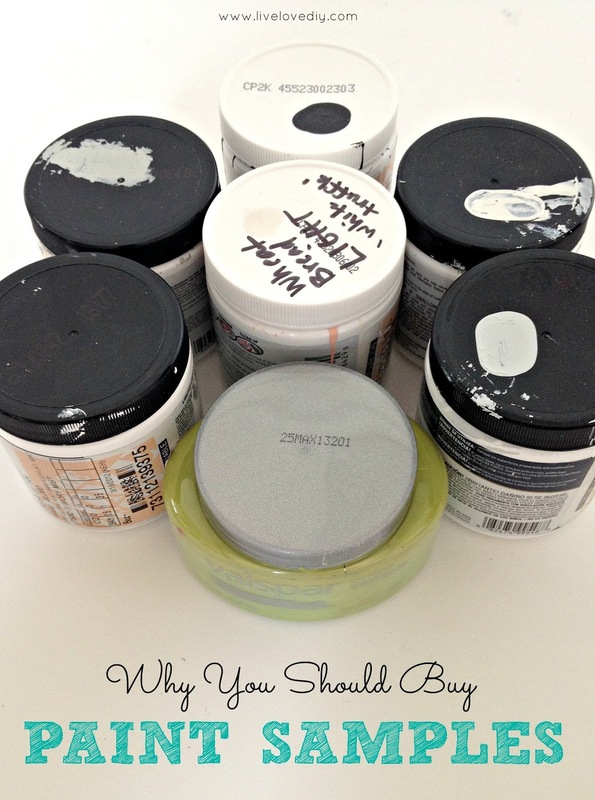 Buy a paint sample before buying the gallon. I know how it feels....you're in the store, looking at a million paint chips with funny names. You're not totally sure about the color, but you don't want to have to come back to the store. I know. I get it. However, it pays to buy the paint sample and take it home to test it on your wall. As tempting as it is just to take the plunge, it's never fun to realize after you get home that you just invested in a gallon of paint that makes your wall look like a banana. So take it from me. Buy the sample and test the color on your walls first. 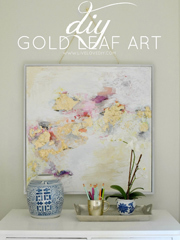 For my best tips on how to choose a paint color, go here. #6. 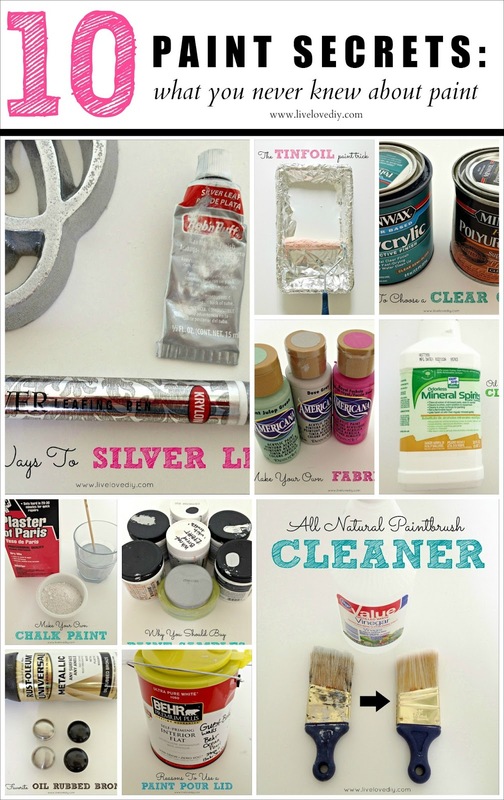 Make your own chalk paint. 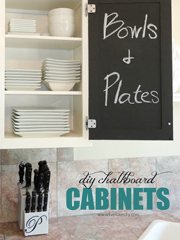 I love chalk paint and I use it often. It's a great time saver, as it's a type of paint that adheres really well, and saves you from having to prime or prep if you don't want to. I make my own version by using plain interior paint mixed with Plaster of Paris (affiliate link). You can find Plaster of Paris at Home Depot or Lowe's and it's really cheap. 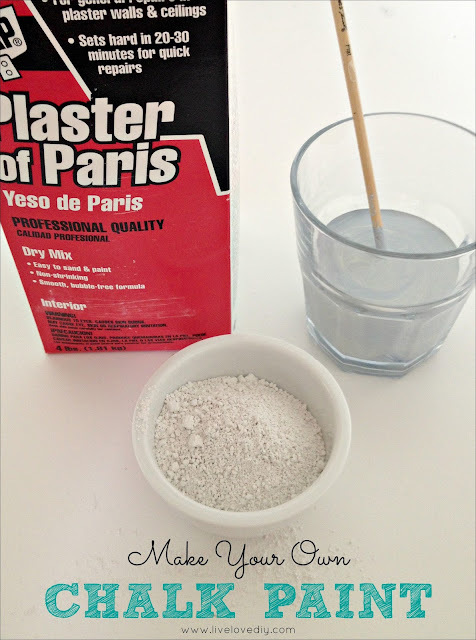 All you do is mix 5 tablespoons of Plaster of Paris with 2 cups of paint and 2 tablespoons of water. Just combine ingredients and stir well. It may even be a little lumpy, but that's okay. Once you brush it on, it evens out. I used my chalk paint recipe on my all time favorite thrift store furniture transformation here. And if you don't want to make your own chalk paint, feel free to just buy this stuff because it works, too. #7. 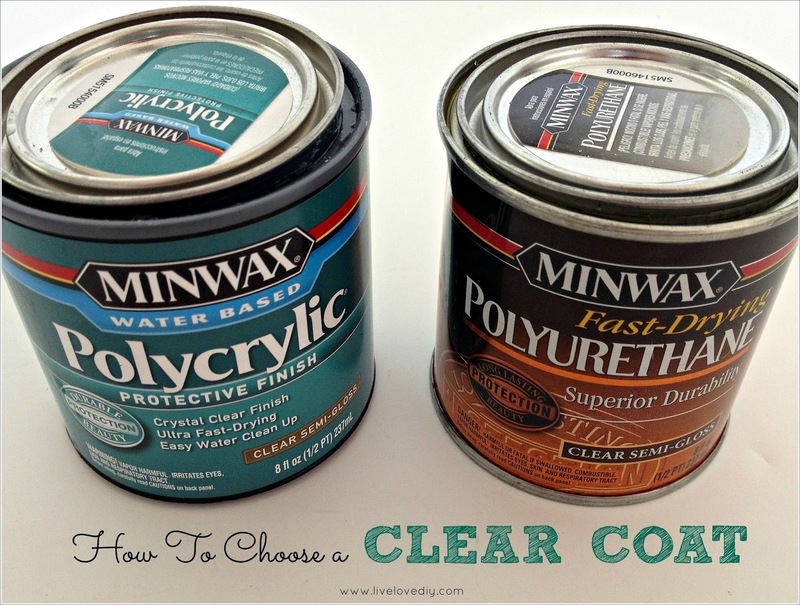 Use the correct type of clear coat finish. 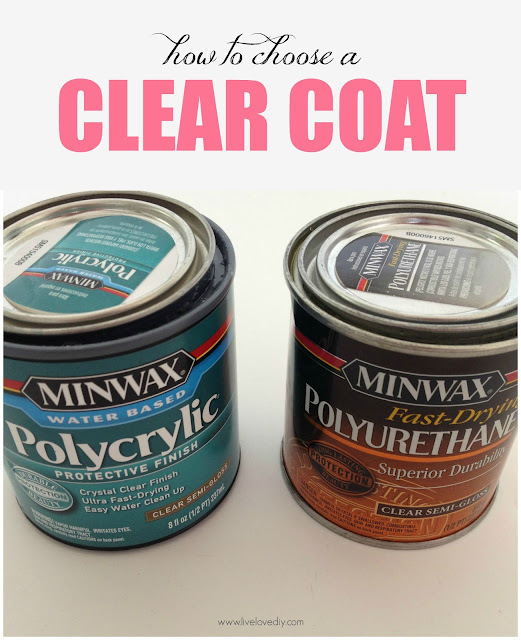 This is something I wish I had known when I first started painting furniture, as I ended up having to redo several pieces due to using the wrong clear coat. For most furniture paint projects these days, I use Polycrylic (affiliate link) as my top coat. It gives me the durable finish I want, but doesn't yellow over time like Polyurethane will. I definitely painted a few pieces back in the day and watched my pretty white paint turn yellow because I used Polyurethane instead of Polycrylic. Also, I like Polycrylic because it cleans up with water. You'll have to use mineral spirits for Polyurethane. #8. 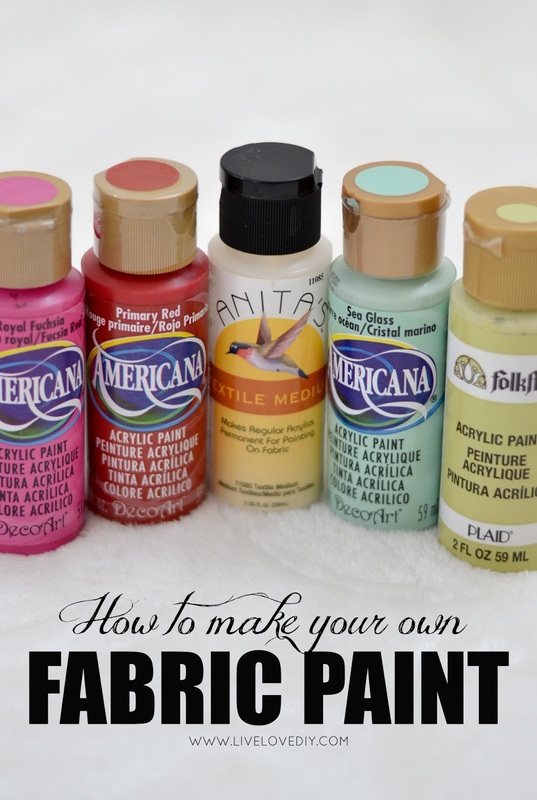 Make any color paint into fabric paint. You can get fabric 'textile medium' at most craft stores (I like the Anita's brand). You just mix it with any color acrylic paint and it instantly turns it into fabric paint. I'm totally obsessed with it. #9. Try Rub n Buff or a Silver Leafing Pen to update metallic accents. 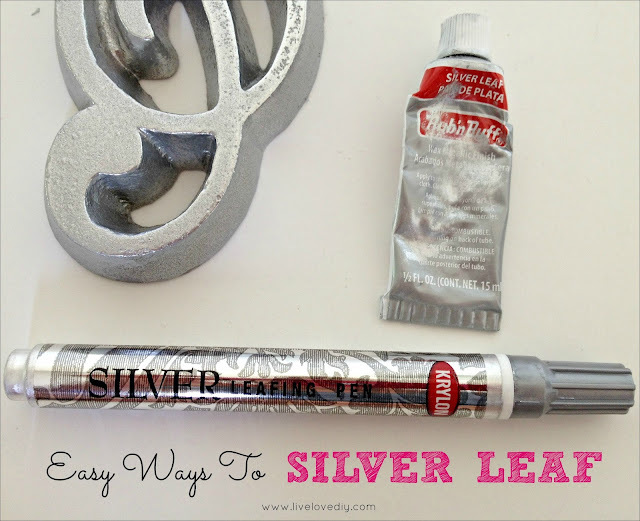 I love silver spray paint and have used it on tons of stuff, but I've found that for small items, Rub 'n Buff and the Krylon silver leaf pen (affiliate links) do a much better job. You can see some of my Rub n Buff projects here and here. When we first moved into our house, I didn't have the money to replace all of our doorknobs, hinges, and cabinet hardware. They were all mismatched and outdated, and it drove me crazy. So, after a few months, I eventually decided to take the plunge and try spray painting everything. And luckily, it was a total success. 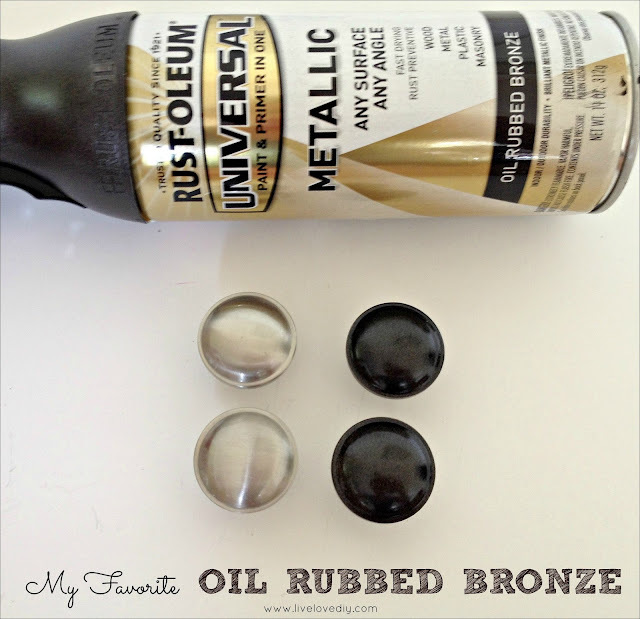 I used the Rustoleum oil rubbed bronze (affiliate link) for all of our doorknobs, and it's held up perfectly every since. See the doorknob before and afters here. And those are my top 10 paint secrets! Thank you guys so much for being here. I appreciate it so much! Great tips! I wish I would have been using that tinfoil one for the last month as we get our house ready for sale! How can I make different colored chalk paint? Love everything on your Blog! I have been so inspired! We purchased our first home a few months ago and I am really trying to make it pretty but on a little budget :) All your tips have helped me see that it is possible! Keep on doing what you are doing!! Virginia - simply awesome tips!!! I know I am going to use every single one of them. Thank you so much, pinning and have a fabulous week! Thanks Virginia! So I've been painting for YEARS :) but you still managed to teach me a few new tricks and remind me of some I should be doing different! Great tips and tricks Virginia! For your #1 I kinda do the same but use a grocery bag instead of tinfoil. Same idea.. and I didn't know about your #8 - that's so cool, thanks! These are such great tips! I really need to try the foil in the paint tray! Girl these are awesome tips...some I never knew, and a few I did. Thanks for sharing I will definitely be using tin foil next time. Awesome tips... the one about vinegar is soooo helpful right now!! My fac Purdy brush is getting stiff with paint I didn't get out..now I can!! Great tips. Making my own chalk paint is on my to-do list. And I'll have buy some of those pour lids. It will definitely be worth it! Better than tinfoil is to put your paint tray in a medium sized garbage bag. Same effect as the foil (your tray stays clean) but you can flip the bag inside out, cut a small hole in the corner and squeeze nearly every drop of leftover paint back into the can. 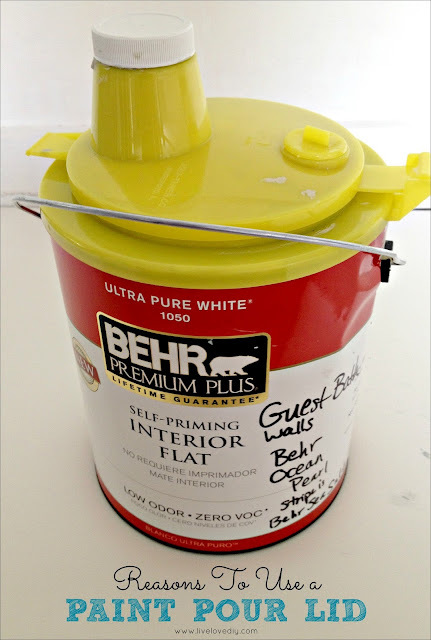 Make your gallon of paint go further! Great tip, Barb! Thank you! 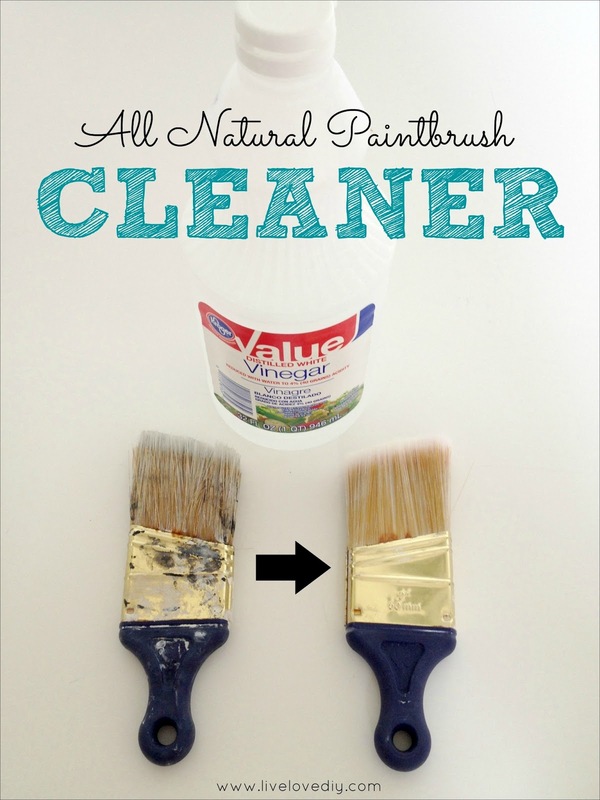 Love the one about using vinegar to clean paintbrushes! I will be trying that one! When you make your own chalk paint- do you use regular paint you get at Home Depot to paint walls with or acrylic to mix with the Plaster of Paris? Want to make sure I do it right. I'm an Annie Sloan Chalk Paint fanatic, but can't afford the prices, so I flipped when I saw your post and am dying to try your recipe. I am currently in the middle of a painting project and am using a tip my Mom gave me. To cut in your ceiling without taping, use an angled brush, put paint on the side that touches the wall, put your brush in the ditch (where the wall and ceiling meet) and brush a slow even line. You will get an even line of paint on the ceiling, but it looks fine because it is even. This has made my life so much easier! Also, good tip about the foil. I use the disposable plastic paint tray liners. You can buy a pack of 12 pretty inexpensively. I'm always looking for ways to increase efficiency this is great! Have you ever tried to ORB bathroom fixtures? I'm wondering because I would like to help my parents update their bathrooms in order to put their home on the market, but I know they won't go for new fixtures. Wondering how well ORB spray paint will hold up to faucets and such. Suggestions? I'm so glad I found this! Thank you for sharing! I can't believe that I went all these years painting without putting tin foil in my tray! Instead of using my sample paint strictly on the wall, I will go out and buy white posterboard and paint the poster board. This way I can move the poster board from wall to wall and get a feel what it looks like in different lighting whether it's the lighting in the room for lighting from the Sun. another plus, then I don't have to paint over the sample paint on the wall if I don't choose to use that color.. These tips are SO awesome! Thank you for this post :) Just pinned it! Such a fab post - I've come back to it at least six times already, and used half the advice already! You've even inspired to me track my own progress (www.secondhandhome.co.uk)! Hello! I am new to your blog and enjoying the drool-worthy home improvement posts. I am so impressed! I wish I had time to do all these projects! I also enjoy your design commentary since I am clueless when it comes to design and decor. Could you help me to understand why (and when) to use chalk paint? I've seen chalk paint for painting areas where children can use chalk to decorate/draw/etc. Is this the kind of paint you are making yourself and using to paint furniture or is it some other type of chalk paint? I'm confused! When painting a project that is going to take more than day, we wrap our rollers and brushes with foil. You can use them the next day. Paint is still fresh on them. No need to clean them if you are using the same paint. When I am going to repaint in24 hrs. i wrap my brush and put in freezer till I use again saves washing out after each use. Hey girl! Loving your blog I just so luckily stumbled upon!! I love how you did your door handles and knobs in that lovely ORB, but what would you recommend if I'm looking for more of a brushed stainless steel look for door handles...to cover over ugly, dated gold ones. A spray? Or maybe that silver rub stuff you had talked about?? Help! I'm a desperate woman...I give those doorknobs the evil eye whenever I walk by!! Another super great painting tip. If you need to stop in the middle of a project and don't want to clean your brush - simply put it in a baggie and stick it in the freezer. You can put it in the fridge if it is only for 20 - 30 minutes. Just pop it out of the bag and begin painting. i looove love love your blog; I somehow always end up here when i`m googling or pinteresting something, goes to show you have a very good thing going, thanks for all the inspiration and explanations! YOU'R my new BESTfriend! I needed that extra push and I found it on your blog! Thanks for sharing all your ideas!!!! I am going to start this weekend! I keep you posted! Great tips! Just wanted to share one that I learned in an oil painting class... when using oil-based paint, you can use baby oil to clean your brushes. It works well, smells good and leaves your hands soft! WOW! Great tip, Judy!! Love that! I love your tips. One thing I do is with a screw driver and a hammer I puncture holes in the rim of the paint can so that the paint can drain back down when it gets caught from pouring or just from sliding the brush. I'm new to your blog and I. Love. It. I recently found a white dresser for my girls on craigslist. It has gold handles that I thought I would spray paint silver, but there are also flat, gold pieces attached on the drawer fronts between the handles (but they don't screw all the way through). Since I'm not painting the dresser I didn't want to damage/mar it by trying to pop those off, so I thought I would try the rub 'n buff you've talked about. Would you remove the handles to put that on, or just leave them on the dresser? I didn't know how it would dry with the handles "hanging down" and also, does the rub 'n buff require a lot of dry time before you handle it? Thank you so much! I'm really, really enjoying your writing, humor, ideas - you're an inspiration! HI I am loving your blog. I have a dilemma. I have a white piece of furniture that has yellowed using the Polycrylic!! What do you use on white fruniture??? 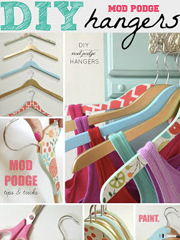 I just came across your blog via Pintrest and I love it!! I am probably getting pretty close to being called in by one of my relatives to be on the hoarding show. I love, love, love secondhand stores!! I do have a very creative mind and have done a few things, but your knowledge and out of the box thinking got me thinking about all of the things that I can do with the stuff I have,. So thank you so much for all the little tips and tricks, as I will be using more than one of them. Also, the tin foil idea in the paint tray is great. I use a plastic shopping bad from the grocery store and it was always slipping around. Keep up the good work and I look forward to more of your amazing ideas. First of all, I LOVE all your projects and have been so intrigued by your blog since I just discovered it a few days ago :) I have a couple questions that I hope you can answer: 1) When you use Rustoleum metallic gold paint to paint wood, is there a top coat/sealer you put on? 2) Have you ever used the Annie Sloan chalk paint? If so, do you use the clear wax on top or another sealer? Thanks in advance and I look forward to seeing more of your creations! Maybe it is in one of your blog posts that I haven't seen or I forgot it - but did you ever cover how to paint kitchen cabinets "cleanly" - like how to take care of the edges? When I was painting it was hard to ensure I was fully covering the rounded/beveled edges where the front wraps to the back without over-painting it or getting drip marks. I was wondering if you had tips for this, it was causing me some frustration over the weekend but I still have 2 bathrooms to do so the tips would still be useful! Love all of your ideas! I am on a budget so I am always looking for great ideas to upgrade my flea market finds. I am moving to a very small cottage, and I will use some of your super ideas. I love your blog! You have such a wealth of great ideas and tips. From now on, I will always line my paint tray with aluminum foil and wash my brushes with vinegar! I think you have convinced me that I need to paint my trim white. I have a lot of dated wood trim like yours, and I'm amazed at what a difference it made. It will be a bunch of work, but I'm ready to bite the bullet. Thank you for the inspiration. Your blog is amazing! I have never subscribed to a blog before and yours I am just obsessed with! Quick question about the chalk paint though. If I were to convert my paint to chalk paint would I need to use Floetrol or does the Plaster of Paris make it go on smooth enough that I wouldn't need it? Wonderful tips...My husband has a few to add, use a sleeve for your tray when he is done painting he takes all the excess paint from the tray then he lets it dry completely. The next day the tray is dry he scrapes a corner then it peels off in one piece. Very cool. For the funnel you used he suggest this tip, take a flat screwdriver and a hammer and pop a few holes in the lip of the can, what that does is when you pour the paint in your tray the paint will slide back in the holes of the can then there is less waste, Put the cover back on the can and the holes are sealed. No money was spent. Finally a blog that gives us real and useful tips! thanks for the info about the Polyacrilic versus the Polyurathen, I was going to paint my white dresser with the Polyurathen but changed it the last minute to avoid the yellow cover...Thanks! 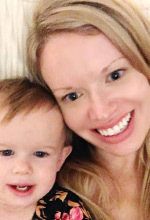 I am ADDICTED to this blog--new subscriber, here! Let's see. In the last week I have: gone to Goodwill and purchased frames, lamps, and a cool wooden vase; made my own clay paint; sanded and painted our dining room table a deep aqua ( I was getting tired of it, it was beat up, but getting a new one was not an option); and purchased fabric and starch to add some interest to our apartment walls! 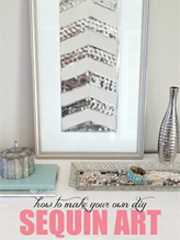 I always loved DIY and you made is so accessible and easy to do. My 10-year old and I are having a blast! Thank you so much for your knowledge on the Wooster Brush! 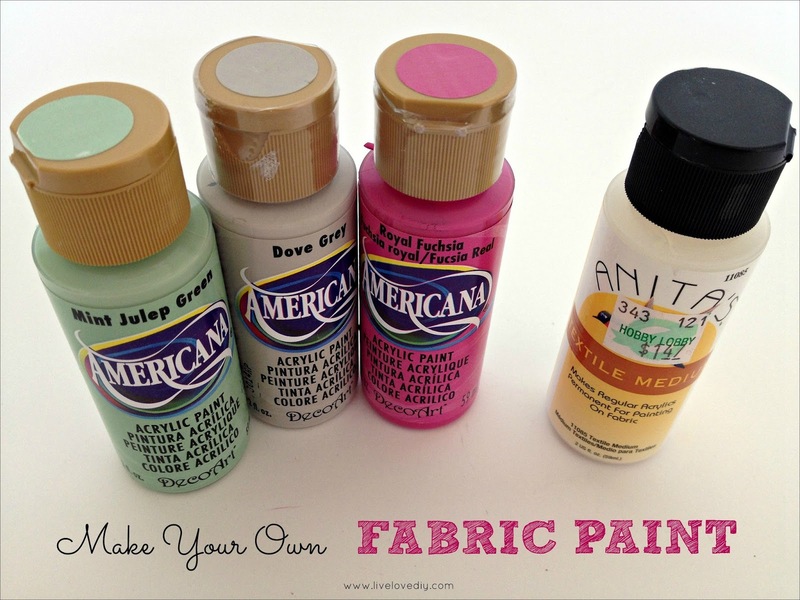 What ratio of Textile Medium do you add to the acrylic paint to create Fabric paint? Thank you for your much anticipated reply. You are too clever and hilarious too. Have you ever read any of Janet Evanovich's books? Your humor reminds me of her. Thank you.